We’ve put together this Italy property FAQ to help answer all your questions about buying property in and moving to Italy. We’ve covered everything you need to know, whether you’re just working out your finances or you’re looking at how to settle in. How can I finance my home in Italy? What are the hidden costs when purchasing property in Italy? How can I buy jointly with family? How can I finance my home with rentals? Do you have an overview of the Italian laws that will affect me? How do I get a residence permit in Italy? Do you have an overview of the Italian school system? What is it like for British children in an Italian school? What’s it like being a mother in Italy? What’s it like being a father in Italy? What is Italian public and private healthcare like? How can residents and non-residents get healthcare? What is A&E like in Italy? How do I open a bank account in Italy? What do I need to do about taxes before I move? What taxes will I need to pay in Italy? How much is VAT in Italy? How can I get tax back? How can I regularly send money to or from Italy? Why is it a good idea to use currency specialist to transfer money? How can I live in Italy for less? Read the Property Buyer’s Guide to Currency to learn how you can easily control the risk of changing exchange rates – which could otherwise see you lose thousands of pounds. How can I move my possessions to Italy? What are my residency rights pre- Brexit? How do get a residence permit in Italy? Is there a step-by-step checklist for buying abroad before Brexit? Is there a step-by-step checklist for moving abroad? What will my rights be in Italy after Brexit? What kind of jobs can I find in Italy? What’s it like running a country retreat in Italy? What should I know about running a B&B? What are the rules on renting out my home? What’s it like renting out your property? What are the Italian rules on owning and registering a car? What is transport like in Italy? What are Italian trains like? What is car- and bike-sharing and why is it so popular in Italy? Can I bring my pet to Italy? What’s it like having a dog in Italy? What types of houses and apartments can I buy in Italy? What condition property is best for me? How can I have a successful viewing trip? What should I plan for my viewing trip? What should I keep in mind for a rural viewing trip? What’s it like doing a renovation in Italy? What are the key steps to follow for buying a property? What should I do if I find a home I want to buy while on holiday? Find out more by downloading our full guide to buying property in Italy. Where is the best area for…? Where are the best places for Brits to buy a holiday home? Where are the hotspots for expats? Where are the cheapest areas of Italy? Where are the best cities to buy in? Where are the best places to buy a country home in Italy? Where are the best areas to open a B&B? Where are the best ski regions to buy in Italy? Where are the best lakeside regions in Italy? Any there any overlooked regions I should consider in Italy? What are the main regions of Italy? Where to buy a home in Abruzzo? Where to buy a holiday home in Apulia/Puglia? Where to buy a permanent home in Apulia/Puglia? Where to buy in the Itria Valley, Apulia/Puglia? Where to buy in Campania and Basilicata? Where to buy in Lazio? Where to buy in Liguria? Where to buy in Lombardy? Where to buy in the Italian lakes? Where to buy in Piedmont? Where to buy in Sicily? Where to buy in Trentino-Alto-Adige? Where to buy in Tuscany? Where to buy in Umbria and Le Marche? Why not pool your finances and buy with relatives to turbo-charge your purchasing powert? Explore our guide, Buying Abroad with Family. How can I get utilities and telecommunications connected? How can I find good tradespeople? Where can I buy furniture in Italy? How can I keep my house cool in summer? What’s gardening like in Italy? What are the best ways to settle in? What customs should I be aware of in Italy? What are the usual shopping hours and VAT in Italy? How can I fight homesickness in Italy? What is winter like in Italy? What is spring like in Italy? What’s the café culture like? Do you have any tips for learning Italian? What are the main Italian newspapers? If you still have questions about buying property in Italy, make sure to give our Resource Centre a call on 020 7898 0549 or send us an email at italy@propertyguides.com. 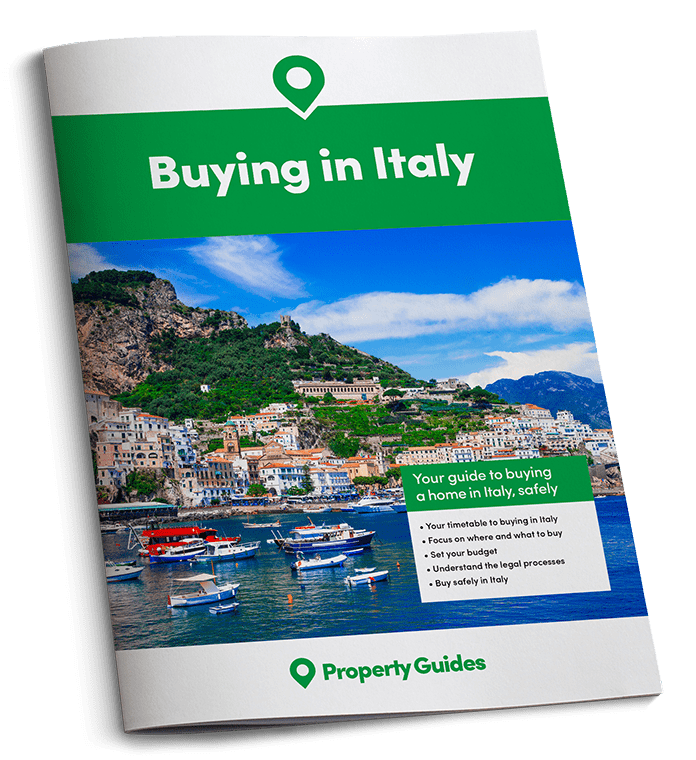 And don’t forget to download your free buying guide to Italy to have all the information about the buying process together in one place, simply by filling in the form below.